Firewatch, the narrative-driven adventure game about spotting forest fires and pondering your role in this great, swirling pit of existential chaos we call life, will be out in just under a week. To remind everyone that it's coming, developer Campo Santo has released four—count 'em, four—new teasers, each one offering a brief look at some of the game's magical moments: fire, pain, poop, and pure, stirring beauty. First up is The June Fire, about a roaring conflagration that took place in July. Next is The Shale Slide, which I would've called Road Rash Ravine, if anybody had bothered to ask. Third is Trowel, and poop. I told you there'd be poop. And finally, we have Ambience, which is exactly what it sounds like, and my goodness it looks nice. Firewatch is now available for preorder on Steam for ten percent off its regular price of $20/£15, or $25/£19 when bundled with the soundtrack. 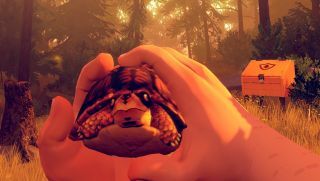 The Firewatch website has also been “relaunched,” and now has a little FAQ and a bunch of new screens including the derpy-looking turtle below. It comes out on February 9.